It could be my New England roots, but I dearly love a good steamed pudding. Deeply flavored, moist and dense, it touches my soul. 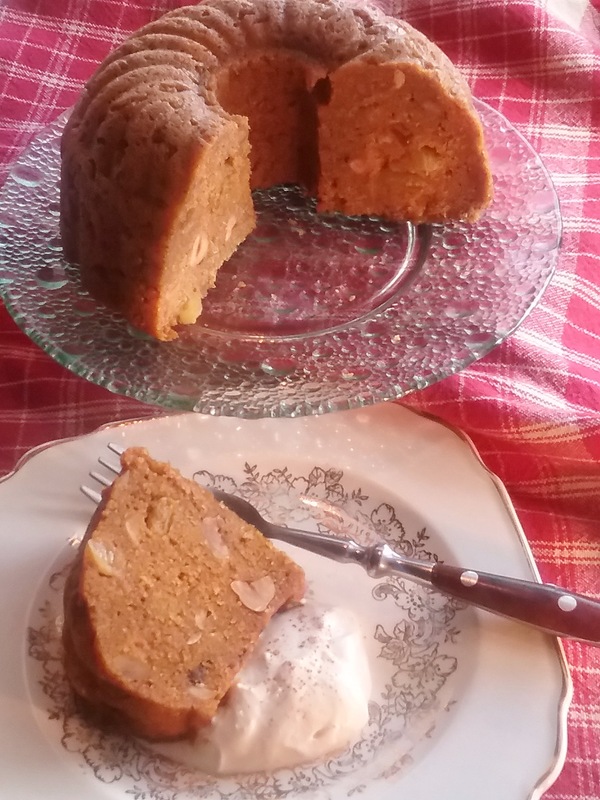 A steamed pudding speaks to me of family hearths and seasonal traditions. 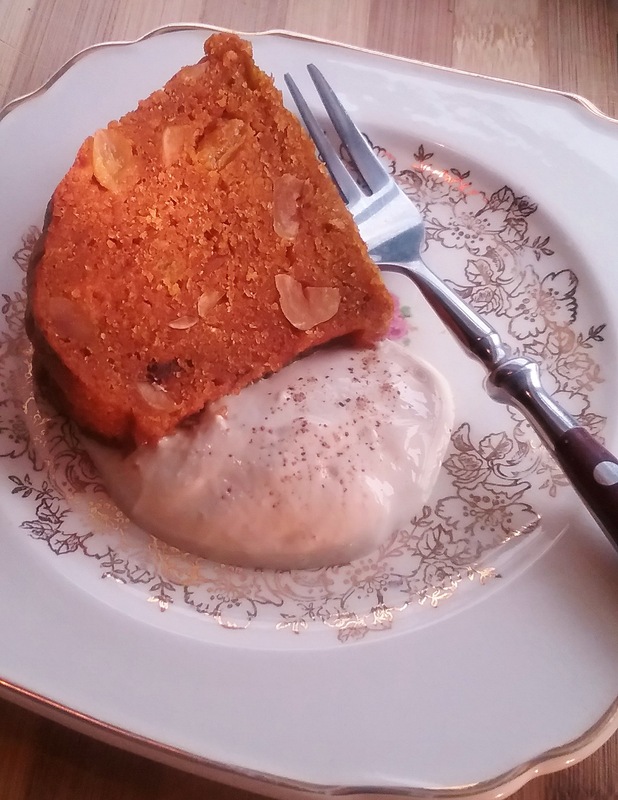 I had my heart set on a Persimmon Pudding, much like the one my sister-in-law, Jan makes. Her well-balance cake has been in her family for generations, and bears all the ear markings of a time honored treasure. It is made in the Joy of Cooking mode of creaming the butter and sugar, then eggs and such are mixed in, followed by the dry ingredients, and finally, all other additives like nuts and raisins are stirred in. Since persimmons have been readily available this year I was excited about the possibilities. I purchased a few good looking Hachiya and set them out to ripen. Two weeks later, still hard as rocks, it looked like the persimmons would not be ripe for a couple more weeks—perhaps in time for Christmas! With persimmons out of contention for the moment, it looked like pumpkin might be the next best option. Besides, it’s Thanksgiving. Why not give pumpkin its chance to shine? 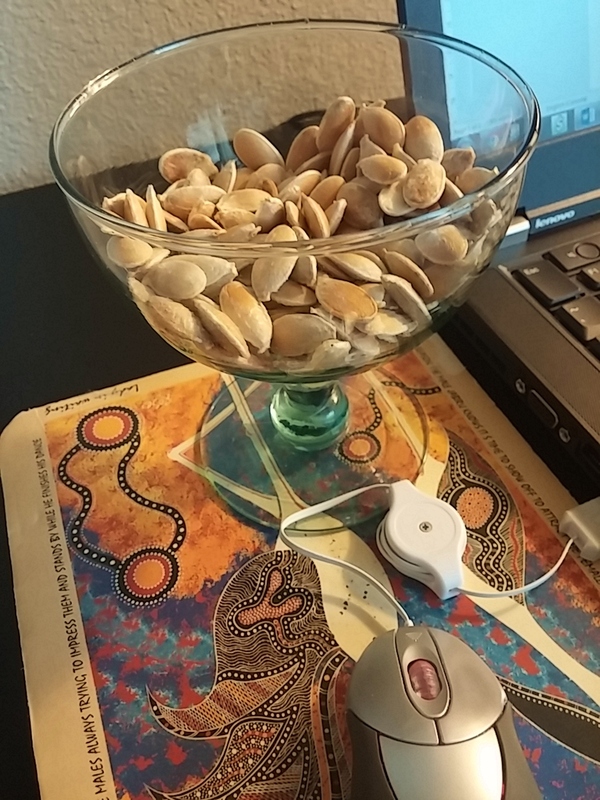 Turns out, pumpkin works well as a replacement for persimmons, with a few minor adjustments. Since persimmons can have a high acidity, baking soda is often used as a buffer. In this case, the baking soda was eliminated in lieu of baking powder for leavening. And what is pumpkin without brown sugar? So, a little was added in lieu of granulated sugar. Everyone was happy and into the mold it went! In Jan’s recipe, the pudding was steamed on the stovetop for 2 long hours. Thanks to my trusty Instant Pot, the pressure cooker could reduce that cooking time by as much as 60-70%. Given the numbers, I opted for 35 minutes, with an additional partial natural pressure release time of 5 minutes. Worse case, I reckoned I could return it to the pressure cooker if it was not set. Once complete and out of the pressure cooker, I opened the mold and checked the contents. It had raised, was a deep amber color, and the top looked quite moist, but that is not uncommon. I dabbed the excess moisture off with a paper towel, and moved it to a cooling rack. In no time, the cake began to pull away from the sides—which I took as a very good sign. It was holding its shape without a problem. Given 10 minutes, it easily unmolded onto the rack for further cooling. 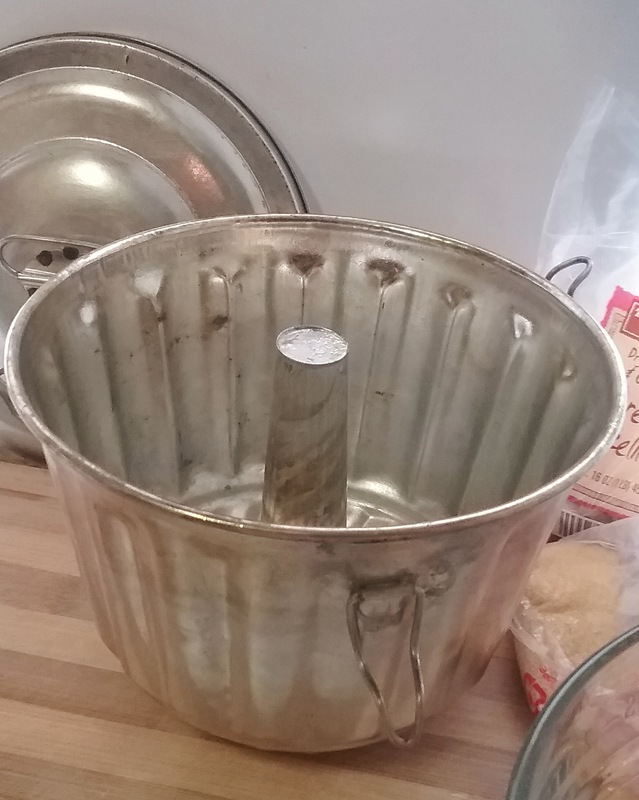 We have steamed pudding! On this Thanksgiving, here’s wishing you all the joy of good food and good company. In advance: coat a 6 cup baking mold well with butter or spray thoroughly with bakers non-stick spray. Plump the raisins and orange juice: in a small microwaveable bowl, cover with wrap, and heat for 40 seconds in the microwave; set aside to plump. Combine the flour through the cinnamon and set aside. Set up Instant Pot with a rack, pour in 3 cups water and begin to heat the water, set to Saute function. To prepare the pudding: in a mixing bowl, cream the butter and granulated sugar, then beat in the brown sugar. Add the egg and beat well. Mix the pumpkin and vanilla into the butter and egg mixture. Add the dry ingredients, stir to combine. Add the raisins and nuts. Spread the batter into the mold, and cover with the lid if it fits in the pot, or lightly cover with foil. Set onto raised rack in the Instant Pot with water bath and seal the lid. Using Manual setting, adjust to Low Pressure and set timer to 35 minutes. When complete, allow Natural Release for 5 minutes and then use Quick Release. Remove from Instant Pot and let cool about 20 minutes before unmolding. If time permits, make a day or two in advance to allow flavors to blend. Store well wrapped in the refrigerator. Serve with custard sauce, a hard sauce or whipped cream. Serves 6 or more. 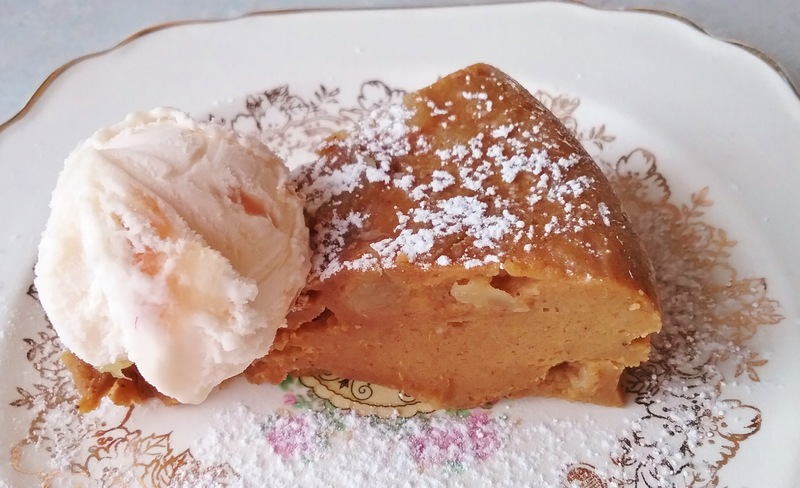 This is a story of an old-fashioned steamed pumpkin pudding with crystallized ginger. In this version, the same dense classic once steamed or baked for an hour or longer, is popped in the microwave and baked until done, or about five minutes. That’s right, thanks to modern technology, it takes longer to tell the tale than to bake it. In other words, you take one mini sugar pumpkin and bake it until its meat is tender. Don’t be alarmed if you discover the pulp is stringy and more similar to a spaghetti squash. It will puree just fine in the food processor with a little sweetened condensed milk and molasses for character. In the old days heavy cream and perhaps brown sugar were added, in this case I opt to keep it simple. Add your eggs, a little cake flour for structure, your typical pumpkin spices and lots of ginger—both powdered and crystallized. If you’d rather, swap the candied ginger for ½ cup raisins, dates, or chopped nuts for a bit of texture and contrast; we aren’t looking for baby food here. Back in the day, they might have used bread crumbs, suet, or anything else available to keep it together and fill in the gaps. The result: a pudding denser than your typical pie filling; one that cuts beautifully. You may be tempted to over bake it; do check it at 4 minutes. If the center is set, it is done and will continue to cook as it stands a few minutes. Serve it warm with whipped cream or your favorite ice cream. Prepare the pumpkin. Cut it in half, remove seeds, and place in microwaveable dish. Add water to bottom of dish to cover, seal with plastic wrap and bake for about 7 minutes or until pulp is tender. Remove any seed fibers from top and scoop out the pulp, you will need 2 cups. Set aside. In food processor puree the pumpkin with sweetened condensed milk until silky. Add the molasses and vanilla. Melt the butter in microwaveable 1-quart soufflé dish or equivalent. Spread it over the interior and pour any residue into the pumpkin mixture. Add the eggs and process. Sift the flour and spices and add to pumpkin with salt and process to combine. Add the ginger and process briefly. Pour into soufflé dish; cover tightly with plastic wrap and microwave for 4 minutes. Press the center, if it is firmly set, remove from oven. If not, microwave an additional minute at a time until center is set. Carefully remove wrap and cover with a plate for 10-15 minutes. Unmold, or slice and serve warm with whipped cream or ice cream. Serves 6. We are deep in the heart of pumpkin season. For local happenings, folks in the Willamette Valley depend on Bauman Farms to get with the program—especially now that their Fall Harvest Festival is in full swing. I’ve heard their Pumpkin Patch referred to as the Disneyland of Pumpkin Patches. Known far and wide for more than hay rides, corn mazes and tunnels, apple tastings and pumpkin hills, students by the busload line up for a jolt of their mayhem madness. I stopped by on a recent pumpkin scouting expedition and was not disappointed. With so many different varieties to choose from, they were helpfully organized by category and color. I stayed basic and settled on a very innocuous 5 pound Cinderella pumpkin. It is so named because it is reminiscent of the pumpkin Cinderella’s fairy godmother transformed into a coach for her trip to the ball. It is a little flattish, with deep indentations; the skin is a dazzling red/orange tinged with shadows ranging from coral to eggplant. 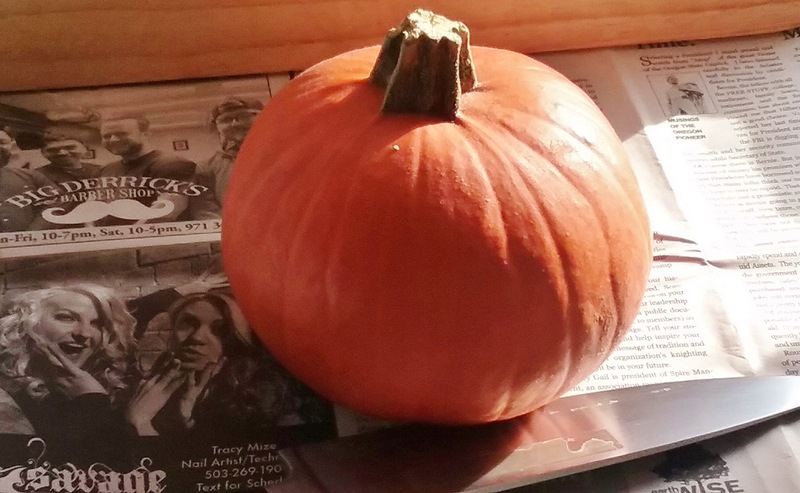 The Cinderella pumpkin is highly regarded for its meaty deep-orange flesh and sweet, nutty flavor. It has quite the lineage, too, with roots that harken clear back to France; so far back, the Pilgrims are thought to have served a variety of it at their second Thanksgiving in the new world. Excellent stock, with historic significance—certainly ripe with culinary distraction potential. Since Bauman’s features both produce and nursery items I headed over to the garden shop and poked around. 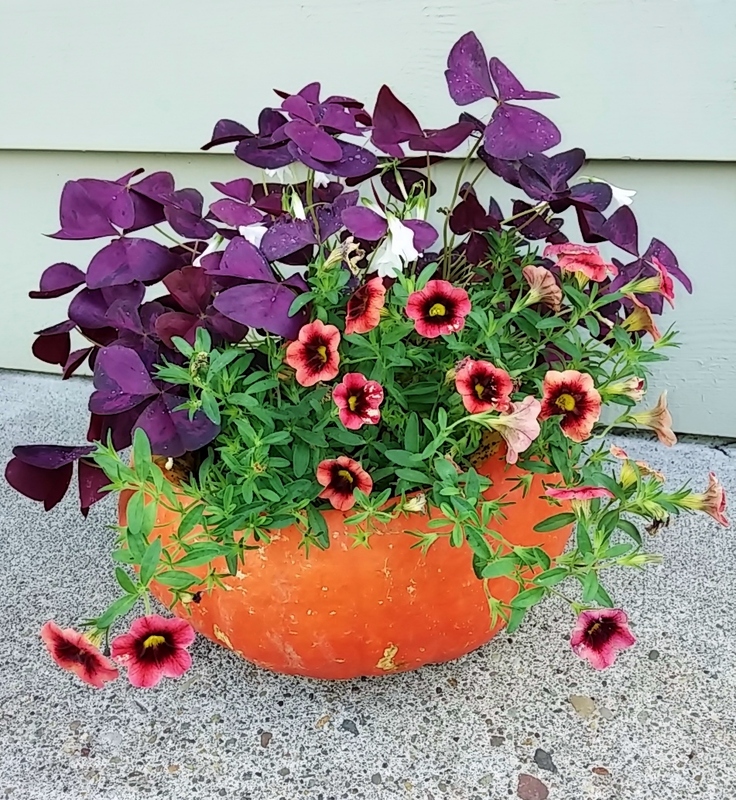 I discovered a couple of inexpensive spot color plants: a wine colored oxalis (shamrock plant) with bright white flowers and a trailing beauty called Superbells Coralberry Punch displaying showy lipstick-pink blossoms with magenta centers. 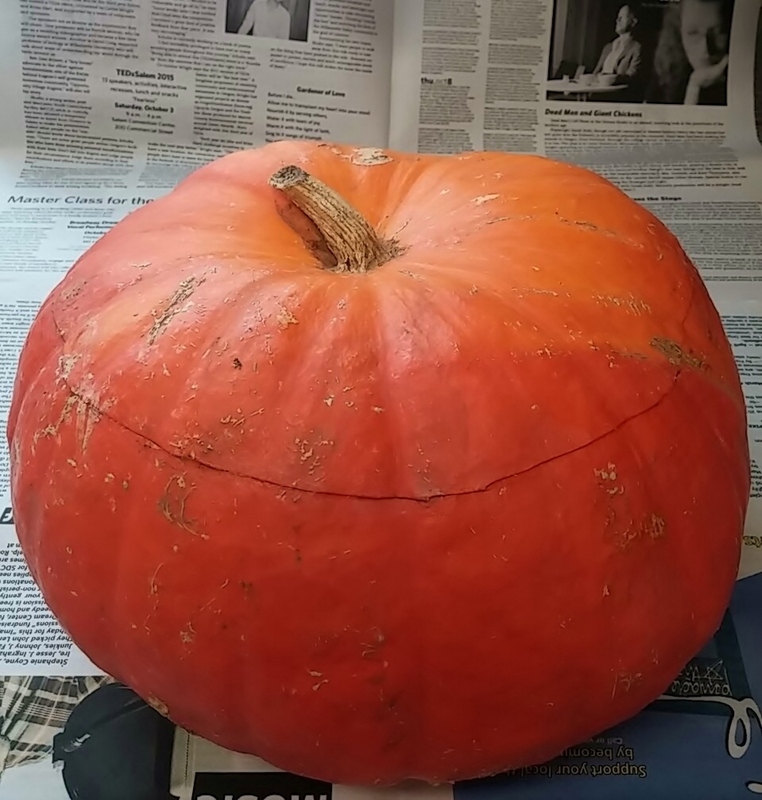 A few days later I cut off the top of the Cinderella pumpkin, scooped out its seeds and filled the interior with the plants. This could not have been simpler; so much for complicated carving. I’ll probably add a bit more potting soil, but for now, it looks cheery—and not very scary—as it graces the entrance to my front door. As an added perk, I gave the seeds a good cleaning, soaked them in a saline solution for a couple of hours and let them roast slowly in a 325-degree oven for about an hour. A nice little bonus.